The Toyota Hybrid TS040 n.8 is a prototype that participated in the 24 hours of Le Mans in 2014. The Japanese manufacturer after two years of training, modified the model TS030, especially in the hybrid part, which differed from the previous system also expanding the front wheels. Sebastien Buemi, Nicolas Lapierre and Anthony Davidson with the Toyota Hybrid TS040 n.8 arrived third at the 2014 Le Mans 24 Hours after a great comeback. The Japanese team after the successes at the start of the season at Silverstone and Spa, was the favorite for the French classic, but Lapierre’s mistake at the beginning of the race that forced the mechanics to a long repair and the withdrawal of the twin car for an electrical problem while he was clearly in command, and the dreams of their first victory at Le Mans faded. The Audi R18 e-tron quattro n.2, with Treluyer, Lotterer and Fassler won the race with their regularity. In the next race in America, Lapierre made a mistake that compromised the victory, which led to the team’s decision to move away from the driver. Buemi and Davidson also took part in the Fuji and Shangai races and WEC World Champion 2014 were graduated. 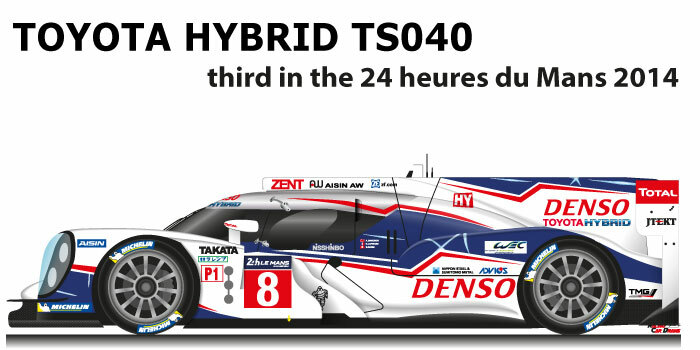 While the Japanese team won the constructors’ title in the LMP1-H category. Toyota 3700 cc V8, aspirated Hybrid. Hybrid: > 480 kW High powered lithium ion battery developed by Toyota. Drive Type: Rear wheel drive, all-wheel drive via KERS on the front axle. Transmission: Transversal with seven speed sequential. Race winner: 6 hours of Silverstone 2014, 6 hours of Spa-Francorchamps 2014, 6 hours of Fuji 2014, 6 hours of Shangai 2014.